On Monday morning, October 8, 2018, Susie M. Edmonds fell asleep in death peacefully at her home in Blackstone, VA. Susie was born May 28, 1936 to Alexander and Ella May Scott. Her education was very important to her and she successfully completed her high school education at the age of 50. On October 2, 1954, she married Ashton S. Edmonds, her childhood sweetheart. They raised six children together. Susie worked for many years at a local sewing factory. After retiring from the sewing factory, she worked in home care for Piedmont Senior Resources and also in Crewe Primary School’s cafeteria. She took great pride in making rolls for the students there. Some of her hobbies included baking, sewing, traveling, and cutting a rug whenever music was playing. While searching for the truth about God, she started studying and associating with Jehovah’s Witnesses in 1968. In 1970, she became a baptized Jehovah’s Witness and remained active in her faith until her death. She was preceded in death by her husband, Ashton S. Edmonds, her sisters, Mildred Hawthorne, Bernice Gilliam, Eula Bell, Rosalee Youman, and Delois Burns, and her brothers, Alexander Scott and William Scott. Susie leaves to cherish her memory 6 children: Ashley Edmonds (Brenda) of Charlotte, NC, Debra Rhodes (Wayne) of Blackstone, VA, Joyce Edmonds and Diane Edmonds of Blackstone, VA, Samuel Edmonds (Carmen) of Jessup, MD and Jeffrey Edmonds (Julie) of Glen Allen, VA; 10 grandchildren: Sharri Rhodes, Carmen Edmonds, Shaun Rhodes, Marcus Edmonds, Brandon Rhodes, Eric Edmonds, Tiffany Edmonds, Erica Edmonds, Ty Edmonds, and Chad Edmonds; 14 great grandchildren, a host of nieces and nephews who affectionately called her “Auntie” and a large spiritual family. Funeral Services Saturday, October 13, 2018 at 2:00 p.m. at Kingdom Hall of Jehovah's Witnesses, Blackstone. Interment Greenview Cemetery, Blackstone. To plant a tree in memory of Susie Mae Edmonds, please visit our Tribute Store. 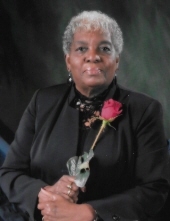 "Email Address" would like to share the life celebration of Susie Mae Edmonds. Click on the "link" to go to share a favorite memory or leave a condolence message for the family.